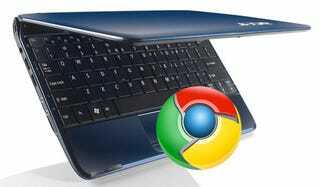 Google's removed the video for inexplicable reasons, however TechRadar dug it up on YouTube, and found Eric Schmidt promising an affordable price-point for netbooks with Chrome OS and the potential for it to be offered on-contract by phone networks. We should be seeing the trickle of netbooks and tablets by the beginning of 2011, with Chrome OS itself being released at the end of this year. Acknowledging that Google itself can't determine price-points for manufacturers of the netbooks loaded with Chrome OS, Schmidt said yesterday at the Atmosphere Cloud Computing forum that he hopes they'll use the "current netbook pricings which are $300 - $400 price points." "Those prices are completely determined, by the way, by the costs of the glass, the costs of the processor and things like that, but in our case Chrome OS and Android are free so there is no software tax associated with all of this"
Will we see a cheaper netbook come out of the Chrome OS nest? Acer's thrown its weight behind Chrome OS, hoping it'll have the first device to market with it, but there are far cheaper manufacturers out there with netbooks—ASUS, Dell, Medion and Lenovo, to name names.